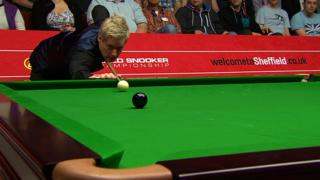 World number one Neil Robertson made a "sublime" 140 on his way to a 10-2 first round victory over Robbie Williams. The Australian showed "outstanding" cue ball control to post the highest break of the tournament so far. Elsewhere, defending champion Ronnie O'Sullivan trails 5-3 to Mark Perry in their best of 19 second-round match.